← Why use the DAA tuning? Dulci-Bro: Where can I get one? We have begun a Lesson series on learning to play the Dulci-Bro and the natural question arises: where can I get one? Homer Ledford is credited by at least one observer as being the originator of a resonator dulcimer. 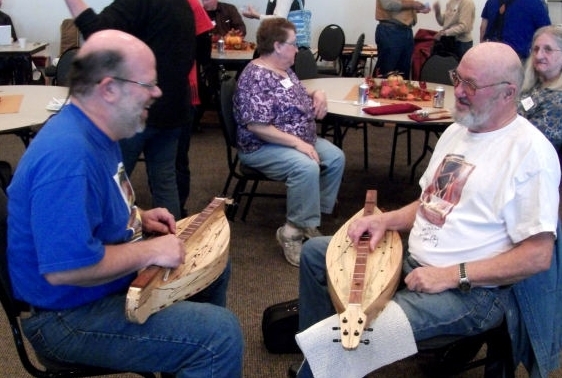 I ordered mine (many years ago) from Don Neuhauser, who quite simply, is an amazing dulcimer builder! Don is in Charlestown, Indiana. Mike Clemmer, of Wood-N-Strings Dulcimers also builds what he calls the “Clemm-Bro” and this link shows him playing it for a local television interview. I have played Mike’s and enjoy it’s tone and playability. Mike is in Townsend, Tennessee. Ben Seymour, of Kudzu Patch Dulcimers is building the “Dulci-nator.” I have not played his instruments, but have one of his Galax dulcimers and absolutely love its playability, appearance and tone. Ben is in Tryon, North Carolina. At DulcimerCrossing.com, we have a series of lessons dedicated to playing this fine instrument in the slide style. As I was searching for this kind of instrument, the depth and breadth of tone was my main concern. Don Neuhauser uses a full Quarterman cone (just like Dobro or National guitars) which includes an intricate web that spreads the resonance of the tone from the bridge throughout the entire cone. That tone is what I find sooooo–satisfying. I agree that Dulci-bro has an amazing dobro guitar sound. I’m glad you are teaching a class on it. I took your blues class a few years ago and loved it. I would love to take your Dulci-bro class someday but first I need to buy one.